Welcome to Tablescape Thursday! I hope that everyone is having a wonderful week! Today’s tablescape features Spode Blue Italian Dinnerware. I have always adored this pattern, and just started my collection. The tablescape I have chosen is simple but elegant. The dinnerware takes center stage. For the underpinning of the tablescape, a simple lace tablecloth was chosen. The place setting is Spode Blue Italian china anchored by cream linen placemats. The flatware is Oneida Michelangelo and the crystal is American Fostoria. For the centerpiece blue hydrangeas were placed in an antique brass container. Flanking the centerpiece are antique brass candlestick holders with cream candles. I’m so happy that you joined me for Tablescape Thursday! I hope that you have a blessed day and a wonderful weekend!!! Such a beautiful blue and white table. Love the plates. Thank you so much Judy! I hope that you have a blessed day and a wonderful weekend!!! Hi Summer! Thank you so much for the sweet compliment! I hope that you have a blessed day and a wonderful weekend!!! As always, your table is beautiful! I love blue as much as you do, I think. Can’t ever have too much! Hi Darlene! I guess we must be kindred spirits with our love of blue! Blue goes with everything in my opinion! 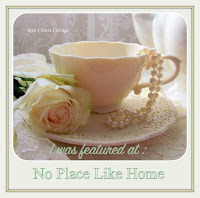 I’m so happy that you stopped by for Tablescape Thursday! Thank you for your sweet comment. I hope that you are having a wonderful day, and I hope that you have a wonderful weekend!!! Thank you so much Janice! I hope that you are having a wonderful day, and I hope that you have a wonderful weekend!!! Shannon, Your table is very pretty. I love the Spode Blue Italian pattern and combined with American Fosteria stemware it looks great on your lace tablecloth.Your hydrangea centerpiece flanked by antique candlesticks completes a put together look for your table. I love your corner cabinet. Hi Bonnie! Thank you so much for your very sweet comments. I’m so happy that you stopped by, and I hope that you have a great weekend too!!! Your table is so pretty Shannon! Those plates are fabulous! Thank you so much Catherine! I have always adored that pattern. I’m so happy that you stopped by, and I hope that you have a great weekend!!! Love this tablescape!! !….I have a collection of the American Fostoria too … Have a great weekend!! Thank you so much Shirley! I hope that you have a great weekend too!!! I know you’re gonna love your collecting of the transferware in blue and white. I have done the same and now I have 14 dinner plates 10 soup plates, 8 dessert plates. I need teacups and saucers. I have most of them in different paqtterns and it’s fun. I love your pattern and your table looks gorgeous! Hi Fabby! It sounds like you are building up quite a nice collection of blue and white. I love dishes of all kinds. It is getting pretty bad, and I am starting to run out of room-lol! I’m so happy that you stopped by, and thank you for leaving such a sweet comment! I hope that you have a wonderful weekend!!! Thank you Pam! I hope that you have a wonderful weekend too!!! Thank you Carol! I hope that you have a wonderful weekend! Such a pretty setting and I love the blue flowers with it! Thank you so much for your very sweet comment. I hope that you are having a wonderful week! Beautiful and elegant!! I love decorating with the color blue! I love the lace, too! Thank you so much Ann! I hope that you have a blessed and wonderful Wednesday!!! Beautiful table! I love my Spode Blue Italian and have collected it for years. A few years ago I spied several servings pieces at TJ Maxx and practically mowed down a row of shoppers to get to them! I like to mix it up by adding pieces from several of the other Spode patterns like Albany and Penny Lane. Thanks for sharing and good luck on your search for more pieces. Hi Sue! You just made me laugh! It’s funny the things we will do when we are collecting dishes! I can’t believe you found several serving pieces at TJ Maxx. What a find! Spode has so many beautiful patterns in the blue and white. I’m so happy that you stopped by, and thank you for your sweet comment. I hope that you have a wonderful rest of your week! So classy and always in style!